A humorous and genuine look at the transformation of a city ad-man to a seasoned ski-bum. The best humour is the sort that comes from real-life experiences, the sort we can relate to rather than some joke crafted in room full of script writers and comedians. 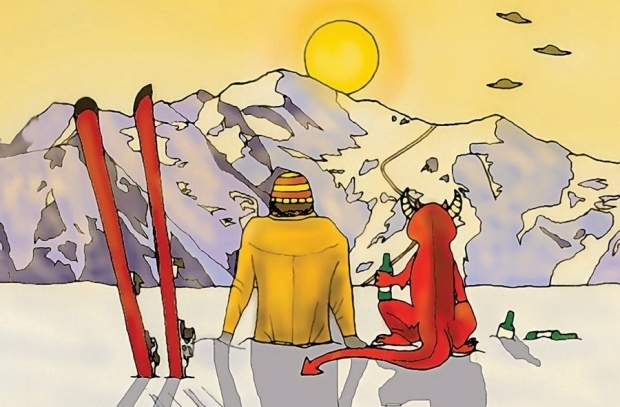 Sure, one might get a bigger laugh for a few seconds on a TV show or in a theatre, but time after time, Skiing With Demons brings up yet another scenario we have all been in, or at least know of someone who has been in, and it’s those moments that ring true and really stick with us. With Skiing with Demons, Chris Tomlinson set out to tell the story of his transformation from city ad-man to professional ski bum. In a world of gap-yaah seasonaires willing to work unreasonable hours for pennies and craggy-faced, bronzed ski-instructors who have been skiing since before they could walk, it’s difficult for a British, middle-aged, recreational skier to make a new life for himself in the winter wonderland that is Morzine, with no suitable qualifications nor experience. 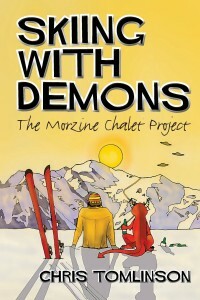 Skiing with Demons is an invaluable read for those hoping to do a season (or several), chronicling the pitfalls, challenges and alien-abductions that go along with it. However, it’s also an excellent read for those same middle-aged, recreational skiers who spend a week a year in the mountains, envying those ‘living the dream’, oblivious to the sacrifices and heartache many have endured to be there. ….and what DOES a ski bum do in the summer? ?